The Riddler - Description | W. W. Norton & Company Ltd. The most mind-bending puzzles on the internet appear weekly in Oliver Roeder’s “The Riddler” column. Presented by Nate Silver’s FiveThirtyEight, an online mecca for statistics nerds, the column attracts a rabid community of puzzlers (including the coach of the U.S. Math Olympiad team and a scientist at NASA’s Jet Propulsion Laboratory) who rush to submit solutions and extensions. Now, FiveThirtyEight presents the first-ever Riddler collection, featuring the column’s most popular problems, which draw on geometry, logic, statistics and game theory, along with six never-before-published puzzles. The simplest require a mere flash of insight, whilst the toughest involve deep applications of analysis and probability theory. Can you rig an election? What’s the best way to drop a smartphone? Can you solve the puzzle of the overflowing martini glass? 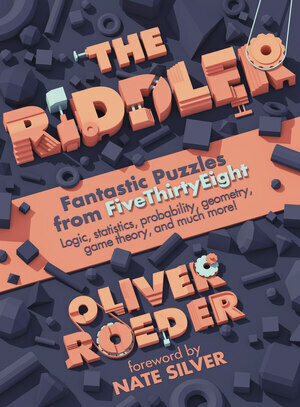 Designed to appeal to a range of skill levels, The Riddler will be the perfect gift for any maths or puzzle enthusiast.